Dreaming Tree! Check them out! I got an email today from a company called Dreaming Tree. At first I hit the delete button, but as it was whisked away to my trash bin, I saw SVG in the preview line. So I went searching for it again. I was sad to read that this new company was due to the parting of my beloved SVG Cuts. SVG Cuts is still around, and Mary is still delivering wonderful projects, but what Leo is bringing to the world of 3D paper crafting is going to appeal to a whole new group of crafters! 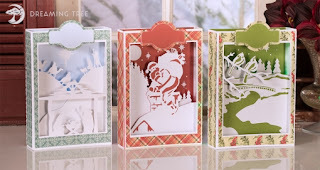 I am mad for the Christmas Paperscape Boxcards! They look so cool and different! He also has a more manly vibe going with the Vegas and Halloween kits. One of the bonuses is you can buy indivdual projects, or bundle them. Be sure you check out his assembly tutorials on Youtube. I've been avoiding my craftroom for a few months, but I'm feeling crafty again. Stay tuned!